Holidays in Ischia take you to Italy’s chic Neapolitan Riviera. It’s located between the sparkling Mediterranean Sea and the rugged mountains, making it ideal for nature lovers and those wanting to enjoy spectacular views. You’ll find a fascinating history which dates back to its roots as a spa town, with the natural thermal springs still said to have healing and rejuvenating qualities to this day. Couples will love the sense of history and culture, as well as spas galore and plenty of opportunities to simply relax. Ischia has long been a spa town, dating back to ancient Rome, and you’ll find glamorous spa havens dotted throughout, ideal for a day of relaxation and rejuvenation. Families will find over 28 kilometers of sands to be enjoyed, as well as water sports and a chance to hike, mountain bike or horse ride in the surrounding mountains. Wander along the beach and you’ll come across the thermal springs where you can bathe in warm waters as you take in the views out to sea. Luxury holidays in Ischia bring you wonderful architecture, long swathes of beaches and a chance to immerse yourself in the history of the area. It’s home to a fantastic range of restaurants where you can pick up traditional dishes like fresh seafood and braised rabbit, as well as international options and gourmet fine dining. When it comes to the evening there are plenty of bars and hotels where you can watch glamorous holidaymakers over a glass of local wine flavoured by the natural minerals of the warm springs. When it comes to finding the right hotel for your luxury holidays in Ischia, choose Sovereign. Our experts have stayed in each of the hotels we have carefully selected to ensure it matches up to our exacting standards, helping you to get the most from your time away. 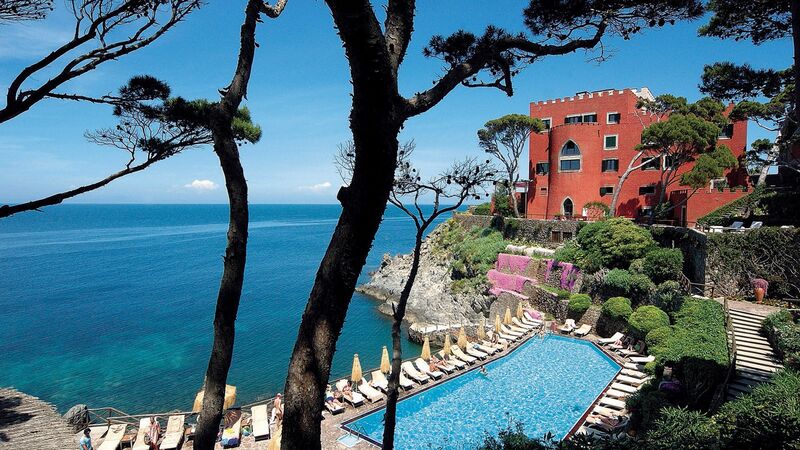 Stay at the Mezzatorre Resort and Spa for beautiful views from its hilltop location, as well as crystal clear waters in the cove below and elegant décor throughout. Aragonese Castle is a forbidding medieval fortress draped over a volcanic rock. But the imposing stone domes and towers hide away a warm interior of suntrap courtyard gardens and richly frescoed rooms that once hosted Renaissance feasts. The best way to get to Aragonese Castle is via the causeway bridge from Ischia Town. From here, you can duck inside the castle or follow the steep footpaths that wind up to the hilltop for wall-to-wall views of the Bay of Naples. The closest airport to Ischia is Naples. Direct flights from the UK take around 2 hours 45 minutes. Transfer time from Naples airport to Ischia is approximately 2 hours. Ischia can be visited from April through to October. Average highs on the island reach 30 degrees, but with a cool sea breeze, even the height of summer can still be very enjoyable. The months of June to August will see the island at its busiest. Evenings on Ischia are very pleasant for those that are staying – many people will only visit the island for the day, so as the sun sets, the crowds disperse and you’ll get to experience a different side to Ischia.